What are starry smoothhound sharks doing in Sussex? The recent news about the sharks in Sussex caused a flurry of excitement on Twitter. We’re proud of our work to build natural flood defences and protect nature at Medmerry. Here’s how it came about. 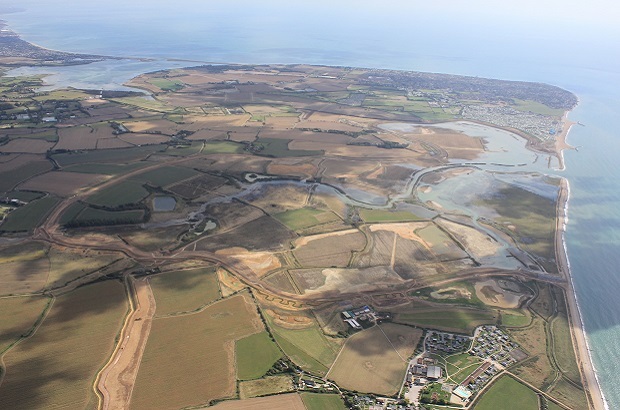 Medmerry is the UK’s largest ever managed realignment scheme on the open coast. Located on the south coast between Selsey and Bracklesham, it is one of the last undeveloped stretches of coast anywhere between Southampton and Brighton – it is a place you must go and visit. In 2011, after many years of planning, the Environment Agency started to build 7km (4.25 miles) of new flood defences, up to 2.km inland from the original coastline. These new defences prevent the sea flooding over 350 homes and businesses, as well as the only road into the coastal community of Selsey. In 2013, when the new defences were completed, we removed a large section of the original shingle beach to allow the sea into the area in front of the new inland defences, thereby creating the largest managed realignment scheme on the open coast anywhere in Europe. The sea now flows into and out of this area every tide, leaving shallow lagoons and areas of muddy ground. In all, we have created around 250 hectares of new habitat for protected wildlife. This new habitat is essential to replace similar that is being lost around the Solent as a result of existing and improved flood defences which protect urban areas. There was nowhere suitable within the Solent to create this replacement habitat, so Medmerry was designed to compensate for some of those losses. Before we could allow the sea into the new Medmerry site, we also had to create new freshwater habitat for all the existing species that lived at the site. Important historic, archaeological and geological features were also identified. We worked with Natural England and local interest groups and other specialists to protect and record all archaeological and geological finds at the site. The major storms over the winter of 2013/14 have accelerated the natural evolution of the site, which has exceeded our expectations. The RSPB manage day to day running of the new nature reserve, whilst we continue to maintain the new flood defences. The footage of the Starry Smoothhound Shark (Mustelus asterias) feeding within the Medmerry site is amazing. They were first spotted whilst our officers were carrying out fish surveys with the Sussex IFCA (Inshore Fisheries and Conservation Authority) and RSPB. We think the school of 50 sharks have come inshore to feed on the crabs in the shallows. The sharks are the latest in a line of unusual visitors to Medmerry – in 2013 the rare Black Wingled Stilt nested there, the first time this bird has successfully hatched eggs in the UK for 30 years and last year Harbour Seals were seen investigating the breach. We are very proud of Medmerry and the positive legacy it provides for the local community. Local people are now much safer from the risk of coastal flooding and the site is having a positive impact on the local economy by encouraging even more tourists to visit the area. We designed the scheme to be a haven for wildlife, but the success of this is exceeding all of our expectations. To find out more about visiting Medmerry reserve please visit the RSPB website. Andrew Gilham is a Chartered Civil Engineer who has worked for the Environment Agency for over 20 years in a variety of roles managing flood and coastal risk across the south east of England. He has been involved in the Medmerry scheme for over 15 years. Suggest its more likely they are dropping their egg Sacks onto the weed beds. Might be worth taking a look after they have cleared the area to see if there are a number of Egg pouches attached to the sea bed as this could be a future nursery for these Mini sharks. Thank you for your suggestion Mr Jones, I will pass your comments to the team responsible for that area. Starry Smoothhounds do not produce egg sacks/pouches.